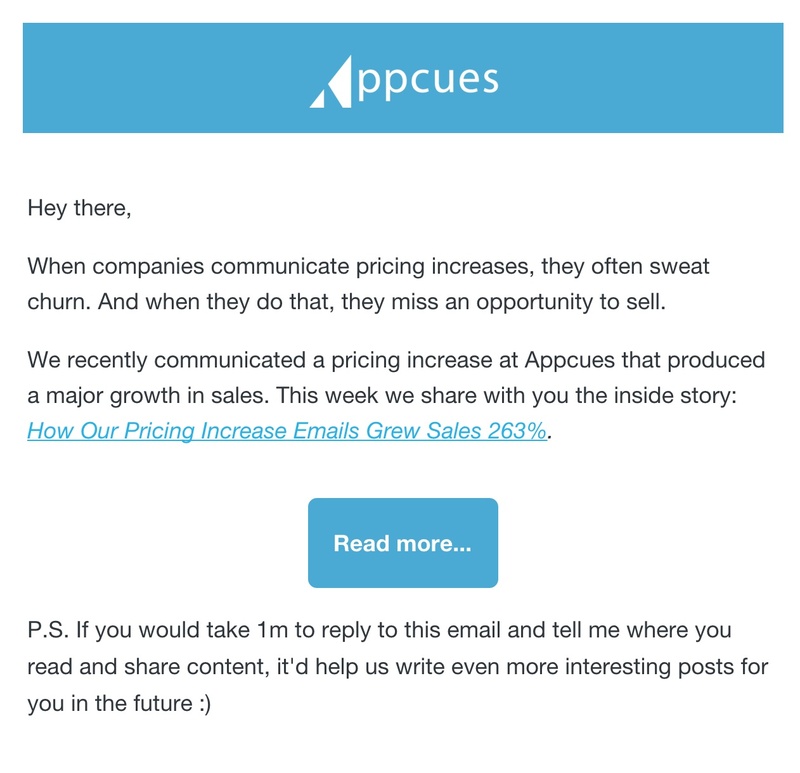 When I took over the Appcues blog and started producing content, there were some hiccups. With each post, we saw a high unsubscribe rate. For every 100 new subscribers, 97 churned. And although we had about 2,000 subscribers to start, the burn rate irked me. Something had to change. At the time—and still—I was reading and writing a ton on user onboarding. So naturally, I read the problem through that lens. If blog subscriptions are like mini products, then many of the lessons we’ve learned on improving user onboarding can be applied to help reduce churn. In user onboarding: it’s all about making a good first impression. You want your users to like you—your brand—and feel like there are some common goals you share. Things like copywriting, graphics and design are essential mediums to express yourself and to communicate your unique approach. Further, reiterating your product’s value can help you define and declare shared goals and build motivation for new users to engage with your product. 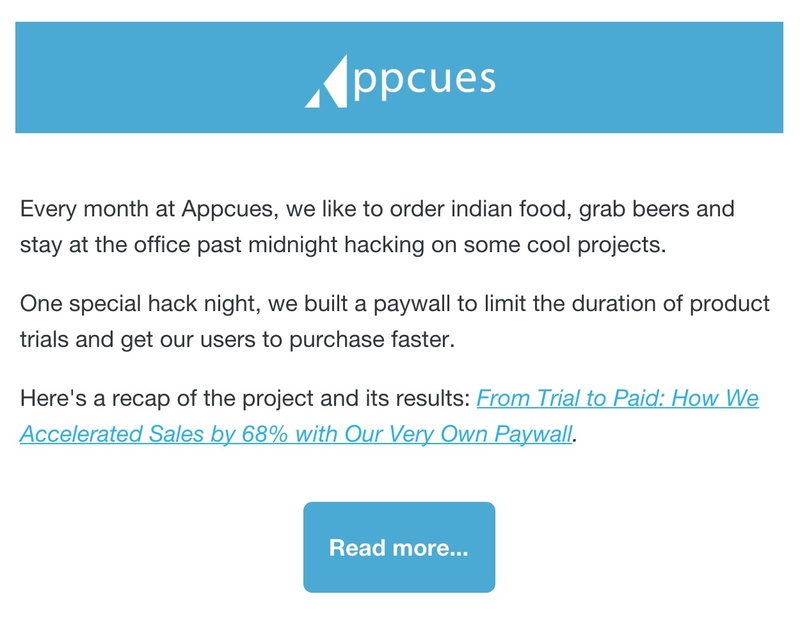 How we applied this to our blog subscription emails: beyond being conscious of the language I included in our emails, we made sure the content of each was of high value. We restructured our first emails when a person subscribes to our blog to send our top performing posts first before they enter our regular email cycle. I borrowed this tactic from Greg Ciotti, who writes for one of my favorite blogs, HelpScout. By giving our highest performing content first, we are more certain to impress our new subscribers. Impressed subscribers are theoretically more motivated to engage with us over the long term. *Note: don’t forget to inform your subscribers that you are sending them your top posts. Not only does that help build trust through transparency, but if a reader has already read a post of yours, they won’t get confused as to why they are seeing it again. Future opportunities to improve: goal setting. We put forth a goal to help you engage, retain, and grow your user-base in our blog suscription CTAs—we use sumo, but we fail to effectively reiterate that goal in our email drip. If we restate the goal, we could reinforce the alignment of new subscribers with our newsletter and help reduce future churn by some margin. 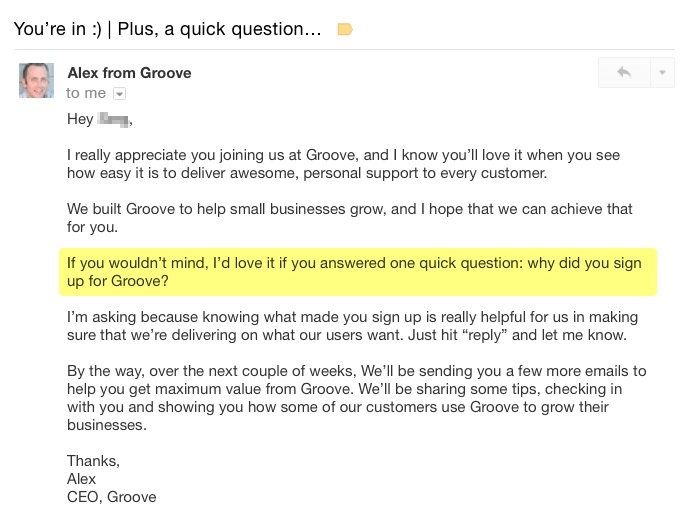 In user onboarding: being personable can help you muster engagement. By giving new users a point of contact, you avoid the impression that you are simply throwing your product over the fence. The way many companies are being personable today often involves a personalized welcome email from the founder. There’s a great article here that details the founder welcome email strategy here, but in sum, a warm welcome helps humanize the product. And when new users perceive your product as human, they are more likely to be forgiving when they encounter frustrations. At worst, this means you are likely to get a support ticket rather than a hard bounce. How we applied this to our blog subscription emails: we make sure our blog subscription emails come from myself or the author of each post. Each email typically incorporates a personal touch with an explanation as to why we decided to write on this topic. Future opportunities to improve: there’s no better medium in marketing than video to create a personal connection. Regular videos would be a great way to connect more with our subscribers. In user onboarding: feedback loops are critical. Without a pulse on your market’s struggles and desires, how are you going to provide them value? The responses I’ve received are typically enthusiastic and helpful. I’ve been pointed to blogs that I didn’t know about before and others have helped me reinforce my current perceptions of what our readers like to read. Future opportunities to improve: I think we could do better when asking for our readers’ reading lists. 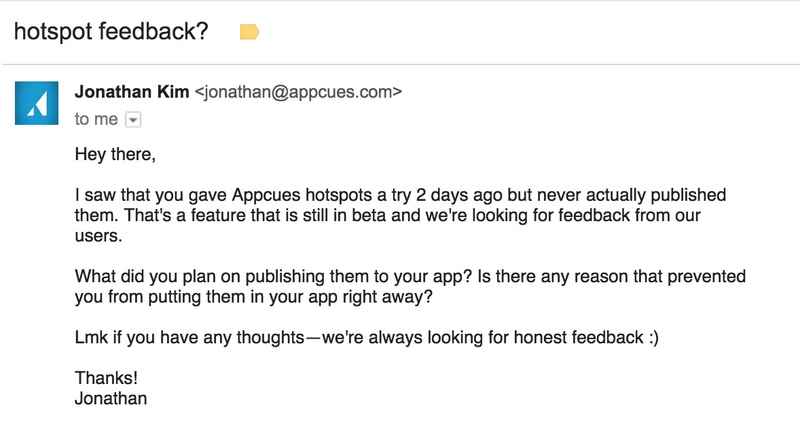 I hypothesize that if I sent an automated email within the onboarding drip from me and without a template, I might get a better response rate. I also think there is a lot of opportunity for further engagement with them. I’d love to be able to tap into our own readers for their wealth of knowledge on the topics we write on. 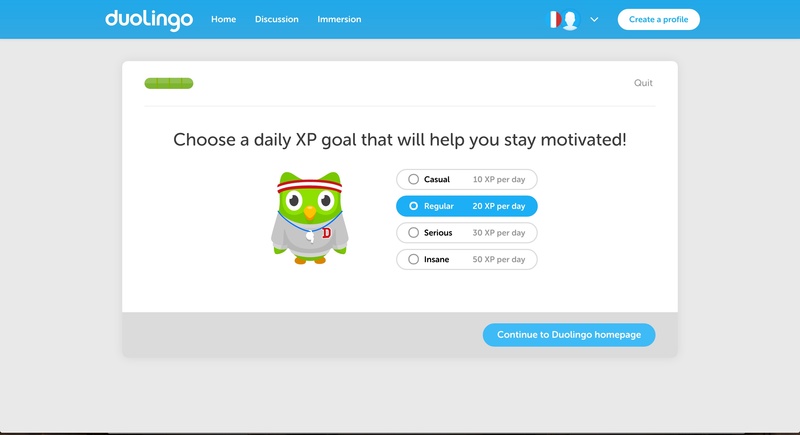 If anyone has success with this, I’d love to hear about it in the comments below. This psychological instinct can be exploited in user onboarding. If you can get a user to commit to something once, they are more likely to follow through with that action later. 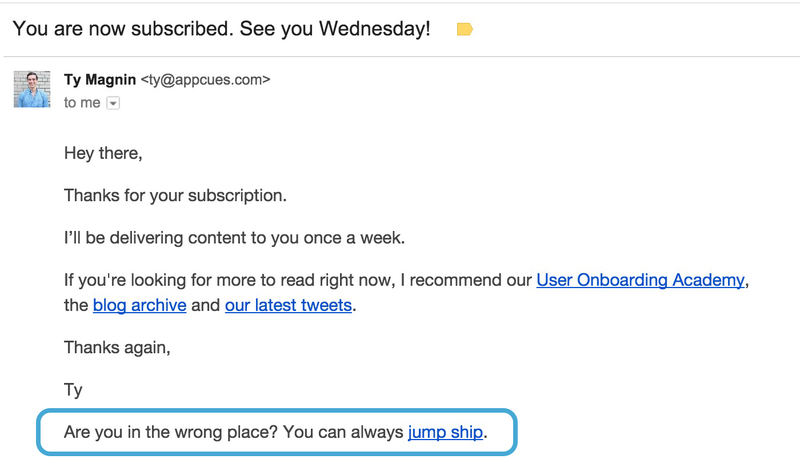 How we applied this to our blog subscription emails: in our first onboarding email, we encouraged users to unsubscribe if this wasn’t for them. Subscribers are very unlikely to unsubscribe when they just signed up. So when blog subscribers opted not to unsubscribe that one time, they are psychologically more prone to not unsubscribe again later. Once a user opts out, it is very hard to win them back. So this subtle tactic can be really helpful to marginally reduce churn. Applying the lessons from user onboarding to our blog subscription has proved fruitful. We cut our unsubscribes in half, reducing the rate of unsubscribe requests from 1.26% to 0.67%. 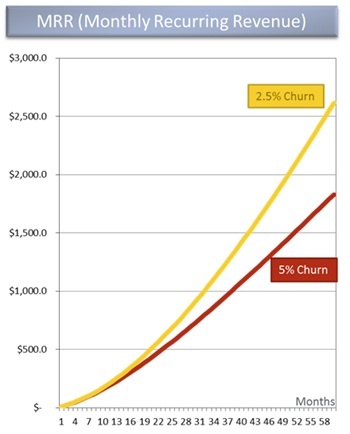 Although those rates are still very small, churn rates on a product have long-term effects as they scale. Apply the same thinking here, and reducing a churn rate can help you stack your subscribership over time. As we continue to iterate on our process and increase our subscribership, I hope and believe we can decrease our churn rate another 100 percent.